Larry Nelson Steele (born May 5, 1949) is a former professional basketball player, best known for being on the Portland Trail Blazers team that won the 1977 NBA Finals. Born in Greencastle, Indiana, Steele grew up in Bainbridge, Indiana, and played collegiately at the University of Kentucky under coach Adolph Rupp. As a junior at Bainbridge High School, he had a high game of 46 points and 38 points as a high game during senior year. He scored a total of 1,646 high school points. His senior year he was selected All-County, All-Sectional, All-Regional, All- Semi-State, Indianapolis News 1st Team All-State, and a member of the Indiana All-Star Team. At the University of Kentucky, he was a three-year starter, averaging 13.1 points, 6.7 rebounds, and 3.9 assists per game. He was selected 1st Team All-SEC twice, Co-captain, MVP, Leadership Award, Hustle Award, led the UK team in assists and free throws. In 2003 he was inducted into the Indiana Basketball Hall of Fame. As a junior in 1970, Steele earned 3rd team UPI/Coaches All-SEC honors and in 1971 as a senior 2nd team AP and 3rd team UPI/Coaches All-SEC honors. 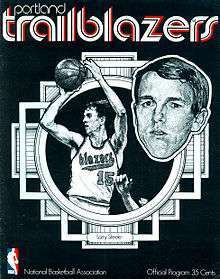 Steele on the cover of a Portland Trail Blazers program in 1971. He was drafted by the Trail Blazers in 1971, with the 2nd pick in the 3rd round (37th overall) and by the Kentucky Colonels in the 1971 American Basketball Association draft. In 1974 he was drafted again by the Kentucky Colonels in the 5th round of the ABA draft of NBA players. 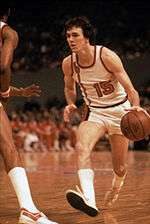 He joined the Trail Blazers at the start of the Blazers' second season and became a roster mainstay for nine years before injuries forced him into retirement at the end of the 1979-80 season. His 610 games in a Portland uniform ranks sixth on the club's all-time list. Steele played his entire NBA career for the team (retiring from basketball at the end of the 1979-80 season). Steele led the NBA in steals in the 1973-74 NBA season— the first year steals were recorded by the league with 2.68 swipes per game. He played 20.7 MPG on the 1977 championship team (starting in only nine games) averaging 10.3 points per game. During his nine-year NBA career, all with the Trail Blazers, he averaged 8.2 points, 2.9 assists, 1.39 steals and 24.2 minutes while starting 337 games. His Trailblazers jersey number (15) was retired by the team on October 11, 1981 and he was selected as a member of the Indiana Basketball Hall of Fame's 1992 Silver Anniversary Team. In 2003, he was inducted into the Indiana Basketball Hall of Fame. After his playing days, he worked in the Blazers front office in marketing and served as a commentator with broadcaster Bill Schonely. Steele later worked as a broadcaster for the NBA on CBS and as a head coach at the University of Portland from 1987-1994. He currently runs a basketball camp in Vernonia, Oregon. ↑ Arnold, Geoffrey; Uthman, Daniel (2007-06-04). "The 1976-77 NBA champion Portland Trail Blazers: 30 years later". OregonLive.com. Retrieved 2007-06-04.